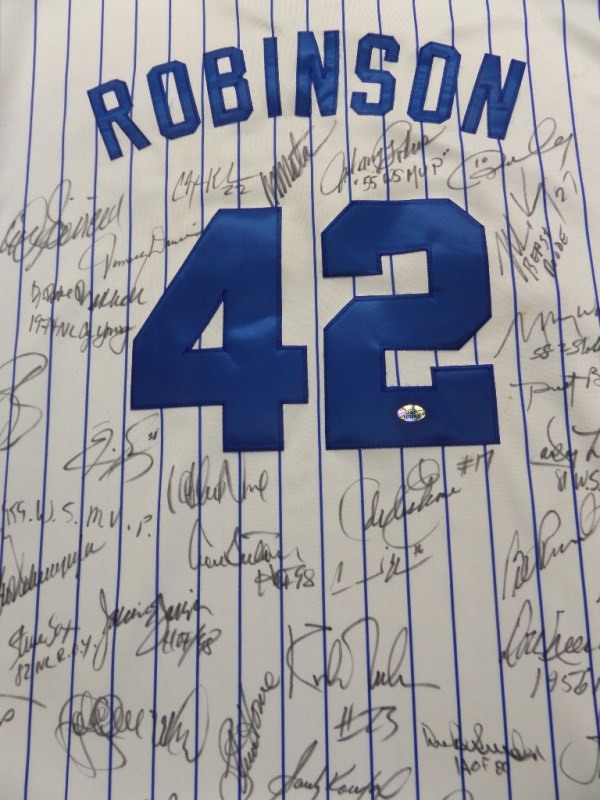 Coach's Corner - "Dodgers Greats" multi-signed Jackie Robinson jersey. Go Back to Lot List "Dodgers Greats" multi-signed Jackie Robinson jersey. This mint, well made, commemorative jersey is an old school Brooklyn home white knit, and comes black sharpie signed by about 30 LA and Brooklyn Legends. Signers include Kershaw, Podres, Cey, Lopes, Sutton, Scully, Piazza, K.Gibson, Dr, Mike Marshall, Snider, Newcombe, Lasorda, and to many others to list. Wow, what a great display piece, just littered with current and vintage signatures from stars ONLY, and value is ?